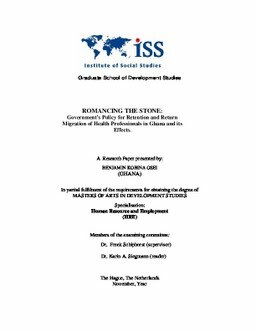 The Research examines the effects of an ‘enclave’ policy introduced by government in the public health sector in Ghana with an objective of reducing attrition and further induce return migration. In doing so, views of experts in public policy, trade union leaders, health sector professional administrators’, representatives of international organisations involved in migration, scholars from the academia, technocrats from the Ministries of Employment and Finance, health practitioners in the public and private sectors as well as returned and non-returned physicians and nurses were obtained through the use of semi-structured interviews. The study reveals that the ‘enclave’ policy is effective in addressing some of the push factors which underlie health sector migration in Ghana. To a large extent, the policy has helped in retention in the public health sector. What is more, it has induced internal health sector migration from the private sector to the public sector. Statistical information provided by the Ministry of Health and the Nurses and Midwifery council showed that migration figures for physicians began decreasing from 117 in 2003 to 32 in 2007 whilst that of nurses decreased from 252 in 2003 to 92 in 2007. The turnover to migration for both categories for the same period was 410 and 1002 with attrition rates of 32.9% and 16.2% respectively. These rates are lower compared to the periods between 1995 and 2002 which was 42.6% for physicians and 25.5% for nurses. What accounts for this is not only improvement in the conditions of service of physicians and nurses in terms of pay increases, as well as an effective bonding system coupled with the establishment of the Ghana College of physicians and surgeons as part of the enclave provisions, but also international actions in the form of restrictive migration laws and ethical recruitment protocols between Ghana and Great Britain. Furthermore, the creation of European Union has limited the job market opportunities for non- European professionals including health personnel from developing countries. Regrettably, the responses to the policy by migrants are not encouraging. Those who return are either retirees or people who want to establish themselves elsewhere in the private sector. Reasons assigned for this, among others, include placement problems on return, loss of social capital at home due to long absence and poor human resource management in the health sector. Policy recommendations to address the retention and return migration include bilateral agreements with flexible tools that could incorporate a variety of provisions. 10 There could be a five year agreement in which migrant physicians and nurses would work in the United Kingdom for three years and in Ghana for two years, with all five years of employment paid for by the United Kingdom. For a successful project, the government should consider a policy that establishes a body that will be fully responsible for migration and return issues. Such a body could compile databases of Ghanaian professionals living abroad and make use of their networks to bring some of them home, even if it is for a short time service to the nation. The Philippines and South Africa have tried this to their advantages. Furthermore it is recommended that government establishes a College of Nursing and Midwifery in Ghana to take care of the professional needs of nurses. The structure of courses should be designed in such a way that participants stay at their workplaces and attend the courses as being done for the physicians. Alternatively, the upgraded nursing certificate to Diploma could be used as entry qualification for a Bachelor degree in nursing at the University. This will be a good mechanism to retain nurses who may wish to migrate to study in Europe.